It sounds boring, it can be boring, but it works. Meal planning is a key ingredient to healthy eating behaviours that help manage weight long term. After a long day at work, most of us have little motivation to get creative in the kitchen. (Well, apart from those who love to cook, or consider themselves ‘foodies’ – they are in a different category!) Many of us come home to hungry partners/housemates/children asking what is to eat. This often leads to a to and fro conversation of what people feel like, what the head cook feels like cooking, what is available in the fridge, freezer or pantry, or often, what is not available in the fridge freezer or pantry. Wouldn’t it make sense if this daily ritual occurred once per week and then could be eliminated from the rest of the week? Sounds good to me! Planning your meals once per week also allows you to go to shop once per week. For those of you that already do this, well done! For those that only shop once a fortnight, you are obviously already extremely good at planning. Many of you would realize that the more often you go to the supermarket, the more convenience items you tend to grab and the more it costs you. By planning ahead you can save time, money and have more nutritious meals ready to go every night. We challenge you to plan a menu for the next week. Then repeat. See if you can do it for a few weeks in a row and it may just become a habit. Step 1: Think about the meals that everyone in your household enjoys. If you are cooking for one, think about meals you can cook that can be frozen in small portions to save cooking at other times. Or think about meals that can be served in different ways a couple of nights in a row eg. a basic mince with tomato sauce can be served as spaghetti bolognaise, add some taco seasoning for tacos, or add chili and kidney beans for chili con carne. Step 2: Look at the week ahead. Do you have any events on and won’t need to cook that night? Do you have any gatherings where you will need to take a dish? Does your family have a takeaway night, or a night you regularly eat out? Note these down. Step 3: With the remaining nights, write down a meal for each night. Step 4: Look at the meals one at a time and list the ingredients for each meal. Step 5: Check your pantry/fridge/freezer to see which items you need. Add these items to your shopping list. Step 6: Think about lunches and snacks. Don’t forget to add these to the list. Step 7: If you have a regular supermarket you shop at, use the ingredients list to make a shopping list in order of the aisles in the supermarket. Step 8: Take your shopping list to the shops – don’t leave home without it! Step 9: Keep the list of meals (your ‘menu’) for the week somewhere in the kitchen. Each morning check this list to see what you are having in the evening. This will prepare you for what you will need to do when you get home and allow you to take things out of the freezer and put in the fridge to defrost if needed. If you have limited cooking skills and food preparation is challenging for you, start by keeping it simple. Pick a meal for each day of the week and repeat every week. For example, Monday may be chicken stir-fry day, Tuesday may be oven baked fish and frozen veges. The meals you plan do not have to be elaborate or fancy, they just need to be achievable for you. A little time taken to plan at the start of the week saves the decision making, the time wasted debating the choices, the need to go to and grab ingredients each day and the temptation of grabbing takeaway food on the way home from work. Grocery shopping can be challenging for some. For example if you have mobility issues, young children, work long hours or get drawn in by the ‘specials’ and are prone to impulse buying, a trip to the supermarket may not be for you. If you are one of these people, online shopping makes sense. Depending on the particular company you use, you can create lists and save for later. For example, if you know there are items you buy every week, you can save a list of these to add quickly and easily each time you shop. If there are particular ingredients you use for meals, you can also make lists for these. Whilst some may feel the delivery fee is a waste of money, look at it another way. How often do you buy items that are on ‘special’, just because they are on special, or try something new just because the supermarket is running a promotion whilst you are there? We often get trapped into buying a little more than we need to and the temptation to do so is less with online shopping. What you save on impulse purchases may well cover your delivery fee. 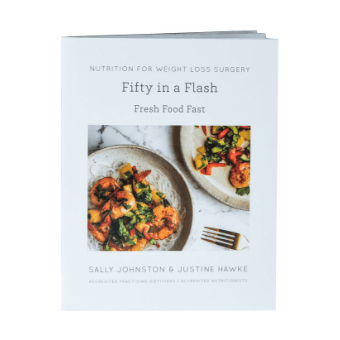 If you need more inspiration for menu planning, you could try our Weight Loss Surgery Meal Plans mini book. There are 21 days of inspiration to get you sorted in the kitchen. You can read more here.